NATURAL HAIR NIGHT OUT CHICAGO LIVE MEETUP @DECA’s 6:00-8:30pm IS TONIGHT! Natural Hair Night Out Chicago is Tonight. Alright! Get your Same Day DisTincTix * right away. Sales will end at anytime before NOON O’Clock for same day VIP Social Business Vendors or Attendees! Thanks everyone! Lets have a great night sleep and an even greater day! Enter your email address to follow this NaturalHairNightOut.com blog and receive notifications of new posts by email. 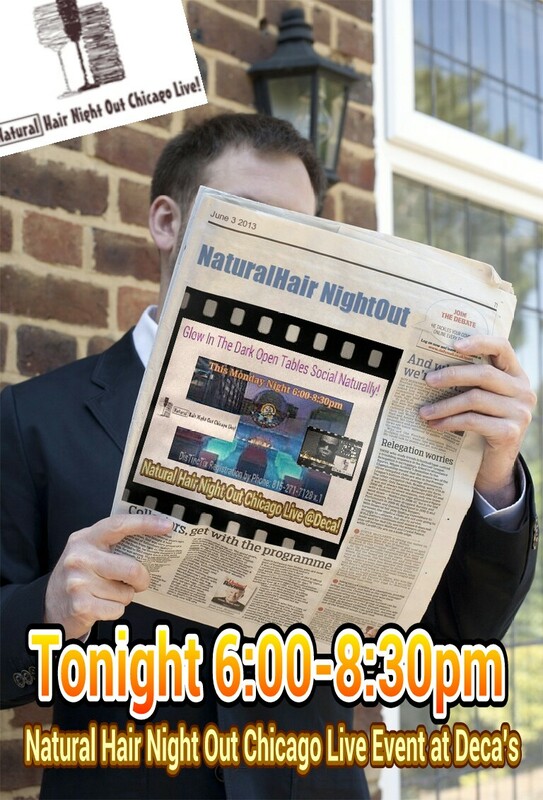 CHICAGOLAND We Are YOUR Natural Hair Night Out LIVE! Natural Hair Night Out Chicago LIVE: "Always Be There VIP, SocialNATURALLY (tm!" Q: Guess what ONE of our lucky @NatHairNightOut “Eventbrite PRE-Registered DisTinxTix ™ guests will find hidden in their Natural Beautiful Icy Orange Dreamzicle Swankk Bags THIS SUNDAY @NatHairNightOut! "Afterwork from 6:00-8:30pm – Get VIP carded and key entry to today's Natural Hair Night Out Chicago VIP Event"
"Vignettes from our August 27th Natural Hair Night Out Chicago LIVE ★VIP★ Invite Only #7 Experience: Hair+Pins+Stripes+PR Power!" Daphne Carter of "Ohhh Sole Fabulous!" Natural Hair Night Out Chicago Live VIP Event Contests! "TRILL ADVICE FOR TRILL MILLENNIALS"
natural hair & all that jolly stuff. Travel is my life. Future travel blogger, foreign service officer, ambassador, study abroad advisor or something along those lines. Spelman College student from good ol' Minnesota.